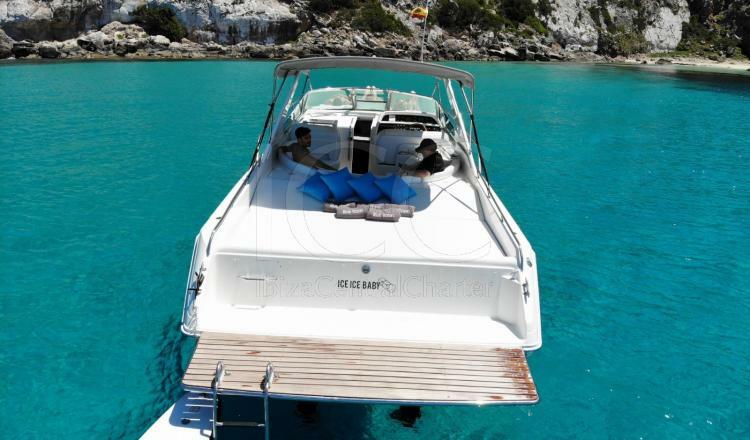 Discover the coves of Ibiza and Formentera in this magnificent Sea Ray 38 available at Marina Botafoch. It has a refit in 2019. 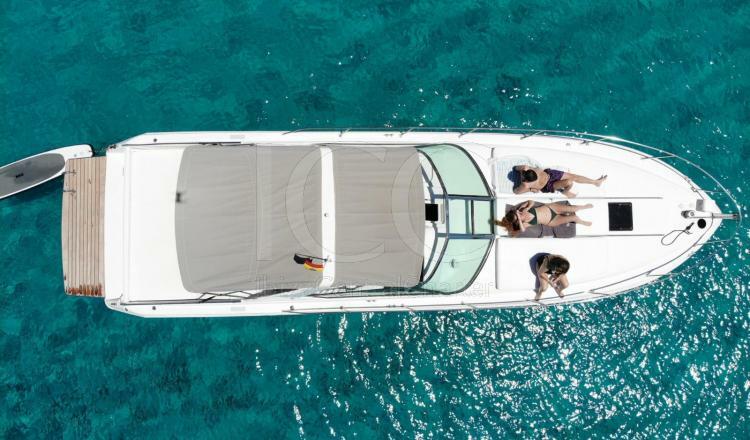 The Sea Ray 38 has 12 meters of length and a sporty and elegant design. 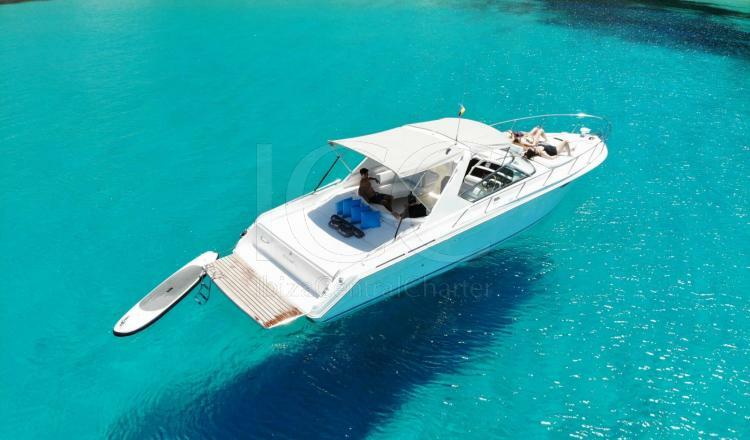 With capacity to accommodate on board 12 people or 11 people plus the skipper. Its exterior stands out for its wide sleeve where there is a spectacular solarium in the bow ideal to enjoy the sun, complemented by a second solarium aft so that no guest is left without a space to lie down to rest. At the stern there is a large space conditioned with comfortable sofas in a semicircular shape complemented by a wet bar equipped with fridge and sink offering a place to prepare meals and sandwiches to regain strength in the open air. This Sea Ray 38 is equipped with an awning that protects the entire bath from the sun, as well as a bathing platform and bathing ladder, perfect for children or people with reduced mobility since it facilitates the entrance to the water. Inside, a cabin with a V-shaped bunk that becomes a comfortable and luxurious conversation area and a toilet put an end to all the needs that can be had on board. 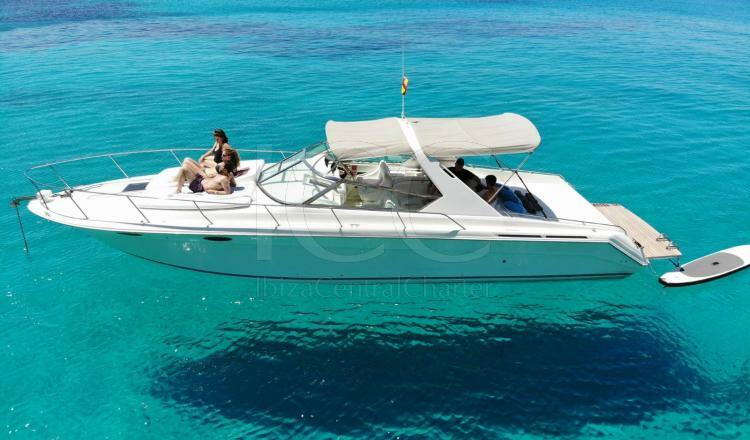 Undoubtedly, this magnificent boat is the ideal option to enjoy with family or friends from the waters and beaches of Ibiza and Formentera.